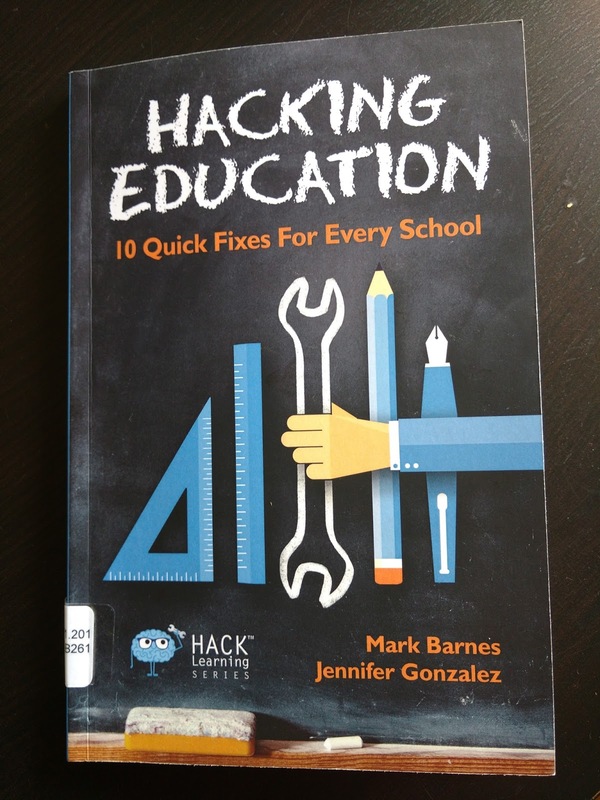 This summer I read Hacking Education: 10 Quick Fixes For Every School. It is by Mark Barnes and Jennifer Gonzalez. It is a part of the Hack Learning Series books. The books offer to help educators "solve big problems with simple ideas." The book has ten "hacks". Think of these hacks as unique workarounds to problems many teachers deal with. However, the fixes are informal and teacher driven so not bound by paperwork requirements or top-down formulas of how to accomplish the changes. They typically do not involve a huge investment of money (usually no money at all). Each chapter looks at a school problem (such as large amounts of time spent at staff meetings) and then shares a potential solution/hack (such as meeting in the cloud) as well as a suggested implementation plan and how to deal with push back, deadlines and accountability. Not all the hacks are related to technology. As this is a technology blog, I am only going to share my reflections on the tech hacks (that said I love the ideas behind the Marigold Committee and The Book Nook). The book is a quick read. Not only is it a short book, 134 pages, but it is written almost conversationally. As the authors themselves state, the book is: "light on research and statistics and heavy on practical advice." Each hack/chapter follows the same formula. First the problem is identified. Second a "hack" is outlined. Next the authors propose a way you could start the hack right away (What You Can Do Tomorrow). Then the authors layout a blueprint for full implementation. As changing an established way of doing things can be challenging for some teachers and administrators, the authors also provided suggestions for overcoming pushback. Finally they provide real world examples of the hack in action. Summary: This hack suggests that schools replace face-to-face staff meetings with backchannel (online) conversations and shared folders (in the cloud). And yes it addresses the worry of people simply not participating or "attending" in these meetings. The hack basically has the meeting items stored on documents in the cloud that are organized in shared folders of some kind, like Google Drive. One folder would house items important for all staff, but then you could have separate or sub folders for subgroups as not all issues/items apply to all staff. In addition to this, an asynchronous dialogue could take place in a backchannel such as Google Hangouts (they recommend Voxer). The authors give suggestions of how to monitor these "meetings" and how to set and supervise deadlines and accountability. Why do all of this? To free up teachers' time. It allows teachers/staff to participate in the conversations/decisions they need to be a part of but disregard the content that does not apply to them that is typically included in staff meetings in a time effective way. Reflection: I just finished working at a small school for the past three years. I think in schools where there is a small staff a blended version of this hack might work. Our staff meetings were social as well as work and people LIKED the time together. However, I believe they would also have been supportive of shorter meetings if some items could be deal with "in the cloud". I think the larger the school, the more successful the hack. In EPSB collaboration between schools is common. I like how the authors have suggested setting up the "meeting" structure with folders, sub folders and a backchannel. I wished I had this hack last year for my cross-school collaboration. I like the backchannel aspect, as I think we naturally revert to email and having different "channels" for different topics is much more effective. I will definitely use this hack in some fashion this year. Summary: Student Tech Gurus is a hack that is meant to address the problem of not enough tech support for teachers/classrooms. The Gurus are students who should be trained to not only solve small-scale tech problems but also do some training as well. The hack has students getting pulled out of class to help with IT issues, so they suggest selecting students who have good academic records. This hack makes me think of Kern Kelley and the Tech Sherpas (who have their own book out). 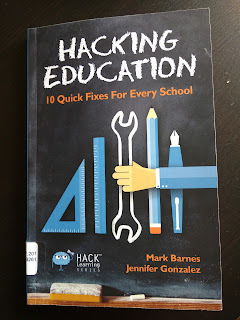 Reflection: As an elementary teacher who has run a technology club in some form for the past seven years, I agree with the authors when they state "fifth and sixth graders are certainly mature enough to not only learn how to solve basic tech problems, but also to conduct trainings." However, at the elementary level I do not agree that only students with good academic records need only apply. The hacks in the book are not prescriptive, rather the message is find what works for you and here are some suggestions to get started. In my own practice, one of the things I found helpful when Smartboards were still relatively new was to have two tech clubs. One for lower elementary and one for upper elementary. Each class in the school had one-two students represented. We would meet over lunch (for the younger students sometimes recess was enough) and I would teach students some common issues and workarounds/solutions. I also would do some training with the older students based on the needs identified by the teachers. These lunch time sessions were supported with hard copy "tech tips" in each class. The tips were pinned near the teacher computer to be used by both the teacher and tech club students. You can imagine how helpful this was when a supply teacher was present and dealing with technology issues! When classroom specific issues arose, I would pull the two tech students to work with them to find the solution. I found having tech support built into each classroom extremely effective and did not require students to be pulled from class. Summary: This hack is for those teachers who want to try a flipped classroom but are concerned about what will actually be accomplished at home (if you are not familiar with what is involved in a flipped classroom, check out this infographic). Essentially this hack is blended learning. Instead of students watching a video at home to prepare them for next day's lesson they watch the video in class. Most division one teachers will have no problem trying this hack as it uses centres. The teacher divides students into groups. Then the teacher creates centre activities. There should be one more centre than there are groups of students. So if you have four groups, you will need five centres. Students watch the instructional video at one centre. The following centre the students work with the teacher to apply the concept from the video. The remaining centres should be independent work. Reflection: I am a fan of this hack and as a teacher I found myself moving in this direction more and more. Each chapter in the book has a section called "overcoming pushback". For this hack one of the issues they identify is "I don't have time to make my own videos". Video creation IS time consuming and not always necessary as you may find what you need on YouTube. However as someone who has made their own videos, I can say that it IS worth it. The authors give good advice in this area: "Give yourself permission to create 'good enough' videos." Related blog posts: Flipping the Grade One Classroom and Technology As My E.A. Summary: This hack is all about using social media with your class. The goal of this hack is to open your classroom to the world, especially parents. Hack seven (The In-Class Flip) and nine work really well together if you put the videos you use (teacher made or not) on a platform parents and students can access at home. The book has some good steps to follow if you are interested in making this leap but are not sure how. Reflection: I think as we continue use social media as a society that we NEED to use it in our classrooms. Not only does using social media in our classrooms embrace how students learn and share their learning but also to teaches them how to do so responsibly. We need to include students in the decisions around privacy and teach them how to make safe social media decisions. For me, in the younger grades using social media is more about bringing the world to your classroom than it is opening up your classroom to the world. If this is something your are interested in, I suggest reading Kathy Cassidy's blog, Primary Preoccupation, or book, Connected From the Start: Global Learning in the Primary Classroom. Summary: The authors call this hack The 360 Spreadsheet. I called it student learning profiles. Regardless of what you call it, the hack is meant to help a teacher truly see students for who they are and help teachers develop strong relationships with students as well as academically plan for them. The hack has teachers put data about students in a spreadsheet (Word, Excel, Docs, Sheets or even paper) so that you have information about students in one easy to access place. Their solution for this push back statement is to look at the spreadsheet regularly. Which I think anyone who has created these knows they should do. I definitely found using a student profile chart useful at the beginning of the year to help me really get a sense of the students in my class. It also gave me a sense of what the class as a whole needed, too. I am not sure I have figured out how to make it a part of my daily, weekly or even monthly practice. It is like flossing. I know I need to do it regularly. I see the benefits when I do. The challenge is how to make it a regular routine in a busy work week. No, there is no eleventh hack in the book! If after reading this blog post you feel you would like to read the whole book, you can order it online. There is an online preview of the book available as well. However, if you are like me, I started hesitating about purchasing all the professional development books I wanted to read. The cost starts to add up quickly! So MY HACK is for teachers to use their local union's library. If you are like me and like to highlight and write in your books, you can sign books out of a library to preview (read a few chapters) a book before purchasing. I checked this book out of the Alberta Teachers Association (ATA) Library. You can sign out books for a month. If needed, they are loaned by mail and you can return the book via mail (ATA provides return postage, too).